Ed. note: We’ve done a lot of stories on guys like Guandolo and the highly lucrative police terror training circuit. This stuff is entertainment, not intelligence. But phony terror experts and trainers continue to cash in, and they’re very popular, no matter how many times they are exposed as frauds. People are free to spend their money as they see fit. 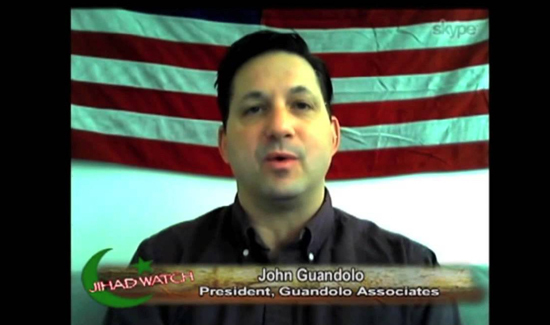 John Guandolo, who runs a “strategic and operational training & consulting” group named Understanding the Threat, travels the country ostensibly teaching LEOs at every level of government how to seek out terrorist cells in their area. Guandolo’s trainings instead serve as anti-Muslim witch-hunts, often times targeting and vilifying local Muslim leaders. Guandolo is using the Mississippi Regional Counterdrug Training Center to conduct his “Understanding and Investigating the Jihadi Threat” training from April 3-5. It is unclear who exactly booked Guandolo, a man who has made a career out of demonizing Muslims and promoting ludicrous Islamophobic conspiracy theories since his hasty exit from the FBI. He recently held a training in Rapides Parish, Louisiana, for a fee of $12,500. The Center for New Community, a civil rights group based in Chicago, keeps a record of Guandolo’s trainings in a report timeline “The Islamophobia Academy.” Guandolo has been quite busy over the past six months, conducting trainings in a number of states including Ohio, Arizona and Texas. At an event in 2011, Guandolo claimed mosques were fronts for the Muslim Brotherhood, and that mosques in general, “do not have a First Amendment right to do anything.” More recently, in a 2016 radio interview, Guandolo said Americans would soon see “dozens of jihadis doing multiple operations in conjunction with the Marxist and socialist groups like Black Lives Matter, which will be, you know, burning and looting cities like they did in Ferguson [Mo.] and Baltimore.